Dance4’s Centre for Advanced Training (CAT) is offering boys aged between 11-17, who are based in the East Midlands, the chance to come and experience a day of dance on Saturday 27 April 2019, 10.45am-4pm. The day will be split into two workshops; a hip-hop workshop and a contemporary workshop. Gareth Woodward, from Nottingham, started dancing at the age of 16 when he took his first class at a local studio. 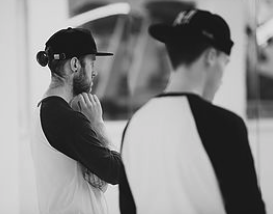 After countless hours of training, a year later Gareth travelled overseas to Los Angeles for the first time where he trained in numerous styles at Debbie Reynolds Studios, Millennium Dance Complex and later, Movement Lifestyle. At the age of 21, Gareth broke into the industry professionally and has since gone on to work with some of the biggest names in the business including Mariah Carey, Cheryl Cole, Coldplay, Take That, The X Factor and The Voice UK. He has appeared in commercials for Cartoon Network, Nokia and Cadburys. Today, Gareth continues to work professionally in the industry whilst teaching his craft regularly in and around Nottingham and delivering workshops across the UK, with the philosophy that you are forever a student. With this outlook he continues to study and train feeding this back into his students. Upon completion of his training at London Contemporary Dance School, Stuart danced in several international tours of Matthew Bourne‘s Swan Lake as part of New Adventures company. He then shifted focus to more choreographic and teaching practices. He has worked at several London colleges including London Studio centre, The Urdang Academy, Italia Conti, Tring Park School, Mountview, The Place and teaches regularly on the Dance East CAT programme. His choreographic work includes the Big Dance 2012 Olympic festival, recording artists, where in 2014 he choreographed Goldfrapp’s live cinema event, opera, music videos and television commercials. The Boys’ Experience Day has been designed to be fun and accessible and it’s also a great opportunity to come and find out more about the CAT programme, the CAT audition on Sunday 12 May, as well as further dance opportunities. Participants do not need lots of experience to attend the Boys’ Experience Day, just lots of enthusiasm. The event is FREE but a booking form must be completed and submitted in order to reserve a place. Click here to fill out an online booking form. For more information e-mail the CAT team on cat@dance4.co.uk or phone 0115 924 2016.